Special to the DailyBoulder writer Keith Martin-Smith, left, met Zen master Jun Po Denis Kelly in Boulder in 2007 and began writing about Kelly's life - which he calls "part Hunter S. Thompson, part Timothy Leary, and part Eckhart Tolle" - shortly thereafter. 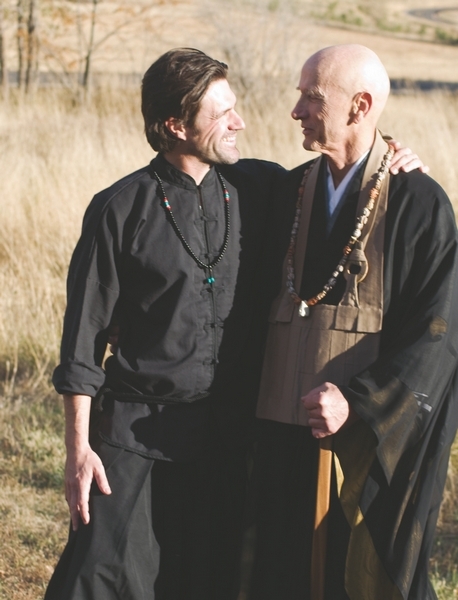 When author Keith Martin-Smith first met Zen priest Jun Po Dennis Kelly Roshi in 2007, he quickly realized the tall, imposing man wasn’t your typical Zen master. The man may have looked the part, with a shaved head and intense blue eyes, but the words out of his mouth didn’t quite match. The two men were both attending a weekend long discussion for leaders and teachers in Boulder. They were matched up in a group of four people and tasked with telling each other about who they were. “That man went first, and he sat back in his chair, taking a moment to make eye contact with each of us,” Martin-Smith said. Kelly proceeded to tell the group about an affair he’d had. Martin-Smith could hardly believe what he was hearing. Two years later, in 2009, Martin-Smith was offered a job writing a biography about Kelly’s life. “From his beginnings in an abusive and alcoholic home in Wisconsin to becoming a major force in the counterculture movement, and then from a life on the run and in prison to a life in a monastery and in service, it is as entertaining as it is inspirational,” the book cover reads. “How does one afford to take a year, or two, off of life to write a book, full-time?” Martin-Smith said. Though he was living in Boulder, the freelance writer, author (his first book of short stories is called “The Mysterious Divination of Tea Leaves”) and kung fu teacher still owned a house in Philadelphia. But Martin-Smith realized he couldn’t turn down the opportunity and instead, decided to sell his house in Philadelphia and use the money to live on while he wrote the book. “I’ve never regretted that decision, even though the chances are slim I’ll ever make the money back,” he said. The resulting book, “A Heart Blown Open,” is “all about how Denis Kelly went from being a drug manufacturer and federal prisoner to a Zen master and innovator,” Keith-Martin said. Martin-Smith will be at the Bookworm of Edwards Thursday night, reading from the book, answering questions and signing books. The event starts at 6 p.m.
During the event, people will get a brief overview of Kelly’s life and teachings and Martin-Smith plans to share a very personal story from the book, “about when I first understood the gravity of what he was teaching, and how that radically transformed my relationship to anger, and my relationships to others,” he said. So how does this book inspire the everyday spiritual seeker? High Life Editor Caramie Schnell can be reached at 970-748-2984 or cschnell@vaildaily.com.